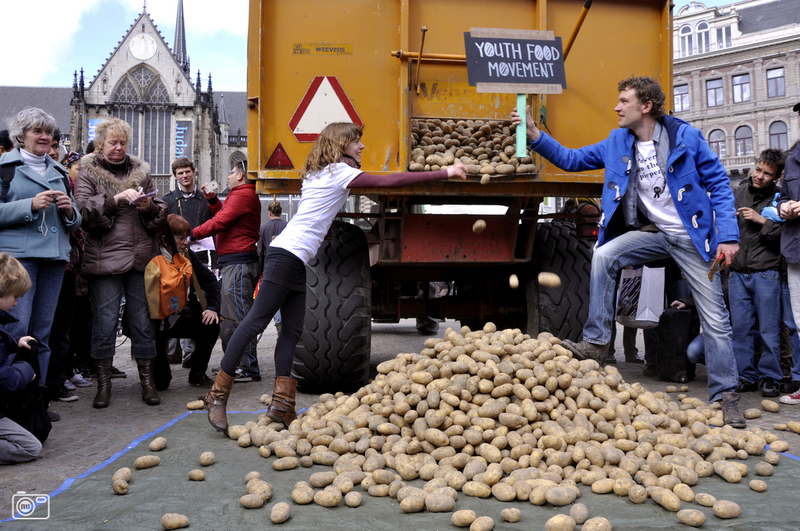 To draw attention to these messy logistics, last April (2012) the Amsterdam-based Youth Food Movement organized a potato dumping in central Amsterdam to draw attention to the issue – appropriately called “Power to the Pieper” (potato in Dutch). 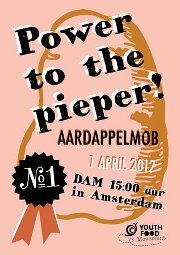 Working with a local organic farmer, a whole truckload of potatoes were brought in and dumped at Dam Square. Prior to the event, people were invited to attend the food dumping – to come and get free, local and organic potatoes. (As much as they could fit on their bike that is!) The day of, passersby were welcomed as well, so long as they had a bag to collect the potatoes. The event received attention of local media, Amsterdam-based organisations (e.g. Strawberry Earth) as well as several international organisations (e.g. Slow Food Movement, What if We Change…) and of course photos from tourists & locals just passing by. After all, it was in the centre of Amsterdam! Want to organize a similar event in your hometown? Check out their video below!